In this high-tech age, many outdoor hikers are equipped with a GPS unit, but it is always useful to know how to use the old-fashioned"way of orienteering and map reading. Taking a base reading on a compass is one of the most fundamental skills. If your GPS fails or leads you astray, having a compass and knowing how to use it is your best backup. Familiarize yourself with the face of the compass. Note the four directions that are always marked on the compass, North, South, East and West. These are the "cardinal points" on the compass. Take note of the arrow, which has the end marked in red and the moveable compass housing, which marks the degrees. If your compass has a baseplate, the baseplate also has an arrow that you point in the direction you want to travel. Determine where you want to go, either by sighting on the object you wish to reach or using a "bearing" previously determined with the use of a map. Hold the orienteering compass with the back of the base plate against your stomach or chest and the directional arrow facing outward, at direct right angles to your body. If you have "sighted" an object toward which you want to go, simply face toward that object, look down at the compass, and allow the magnetic needle to settle so it is pointed to North. Rotate the compass face so the cardinal direction N is in line with the needle point. Make sure the needle is between the two lines on the face of the compass. Check the degree number on the housing of the compass that is lined up with the arrow on the baseplate. This is your heading. Walk forward toward your goal, stopping every so often to realign yourself to the exact bearing (the degree) you have determined as your direction of travel. To realign yourself with the correct bearing, reset the compass face to your degree heading by rotating the compass face until the directional arrow is lined up with your original bearing if the compass has been moved away from the original setting. Simply rotate your body, holding the compass steady, until the needle N is between the two lines on the compass face and go forward until you reach your goal. If you already know the heading, start with Step 6. You do not need to constantly hold the compass in front of you, just go in the general forward direction realign yourself every so often. 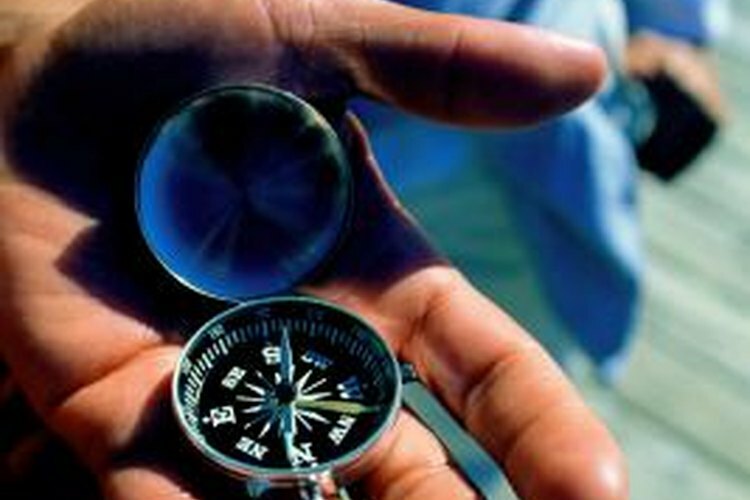 Always hold your compass steady when checking your directional heading.